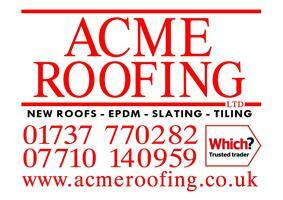 ACME Roofing Ltd - Fascia/Soffits/Guttering, Roofer, Windows/Doors/Conservatories based in Redhill, Surrey. Welcome to ACME Roofing Ltd...Probably the best choice you will make. We are a re roof specialist and offer the service that our customers need, at a price that they can afford. With over 20 years of roofing experience, we are confident that we can do so and provide you with the solution to your needs. We specialise in EPDM/FLAT ROOFS and all other aspects of roofing. All new roofs come with a 10 year insurance backed guarantee ! Qualified in CITB Lead work. We're happy to travel, we've worked all over from Dorset to Brittany (France). We work all over the South East from Surrey, East Sussex, West Sussex, Hampshire, Kent and London. We cover, Surrey, Sussex and south East. Including Banstead, Carshalton, Caterham, East Grinstead, Oxted, Redhill, Reigate.